Baron Davis #85 and Iman Shumpert #21 of the New York Knicks react during the game against the Portland Trail Blazers at Madison Square Garden March 14. 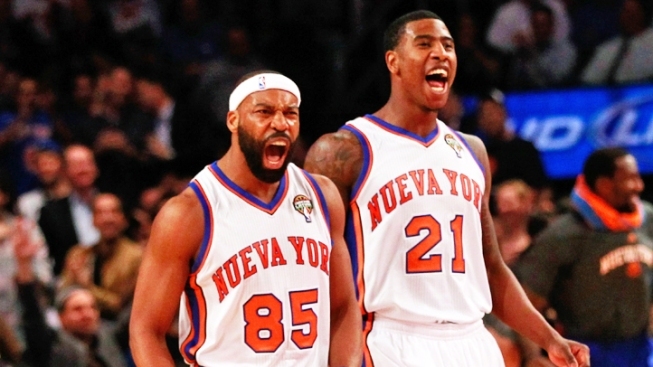 Mike D'Antoni is gone, and the Knicks finally got his offense right. Amar'e Stoudemire made all seven shots in the first half, Carmelo Anthony passed and shot well, and the Knicks shook off the surprising departure of their coach to rout the Portland Trail Blazers 121-79 on Wednesday night, snapping a six-game losing streak. Anthony, who denied wanting a trade or having friction with D'Antoni earlier Wednesday, had 16 points on 6-of-12 shooting and tied a season high with seven assists. Stoudemire finished with 17 points and shot 8 of 10, before both stars sat out the fourth quarter while the Knicks rang up their highest point total of the season. D'Antoni decided to step down Wednesday, shocking his bosses and players. But the Knicks delivered a powerful performance and a good imitation of his offense in their first game under interim coach Mike Woodson, getting 23 points from JR Smith, 20 from Steve Novak, and making a season-high 19 3-pointers, one off the franchise record. The Knicks had dropped into a tie for eighth place in the Eastern Conference before breaking out with the kind of effort that was expected from a team that D'Antoni said was good enough to contend for a championship. LaMarcus Aldridge and Gerald Wallace each scored 15 points for the Trail Blazers, who were blown out for the second straight night and lost for the fourth time in five games. Portland showed no energy after its 92-75 loss in Indiana on Tuesday and played without guard Jamal Crawford, whose name been linked to trade rumors ahead of the Thursday afternoon deadline. So was Anthony's on Wednesday, with a report in the New York Post that he would welcome a deal barely a year after the Knicks acquired him in a blockbuster with Denver. He emphatically denied the report, but it had become clear how much trouble he and D'Antoni had in finding a way to make the All-Star forward productive in his system. D'Antoni seemed committed to figuring it out and appeared in good spirits Wednesday after putting the Knicks through their morning workout. But he had already met with assistant general manager Glen Grunwald and informed him of his plans. They would later meet with Madison Square Garden chairman James Dolan, who said D'Antoni offered to stay before they agreed to a mutual parting. Woodson inherited the job for the remainder of the season, but Dolan made it clear that he would be re-evaluated after the season. Woodson made a good first impression and was rewarded by fans chanting his name near the finish. The Knicks raced to a 25-12 lead and extended it to 55-29 at the break, their fewest points allowed in an opening quarter or a half all season. They had 16 assists on 21 baskets, with Lin getting one of his six by throwing a long pass on the break to a streaking Anthony for a layup. Anthony's passing was even better. His touch pass to Stoudemire led to a first-half dunk, and he dropped a pass backward to Tyson Chandler early in the second for a layup and foul, hopping behind the basket in delight as the shot fell through the net. It was Anthony's inability — or, critics said, unwillingness — to move the ball the way D'Antoni preaches that made it hard for the coach's system to work whenever the All-Star flourish was on the floor. New York had gone 2-8 since Anthony returned from a groin injury. He heard boos again during introductions for the second straight home game, but seemed much happier than in recent games, at one point running to midcourt to greet teammates while waving a towel after a Portland timeout.